The lymphatic system in vertebrates is a network of conduits that carry a clear fluid called lymph. 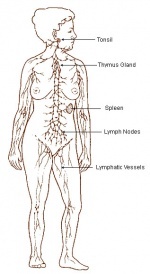 The lymphatic system has three interrelated functions. It is responsible for the removal of interstitial fluid from tissues. It absorbs and transports fatty acids and fats as chyle to the circulatory system. The last function of the lymphatic system is the transport of antigen presenting cells (APCs), such as dendritic cells, to the lymph nodes where an immune response is stimulated.